After 22 months of presidential campaigning, supporters of President-elect Barack Obama are celebrating the nation’s turning point in electing its first African-American president. After 22 months of presidential campaigning came to a close last Tuesday, supporters of President-elect Barack Obama are celebrating the nation’s turning point in electing its first African-American president and preparing for what they hope to be positive changes in the next four years. “I’m very, very happy,” said junior Elizabeth Hanson, political science major and president of Temple College Democrats. “It’s definitely a victory that we were looking for. I’m incredibly proud of all the work the Temple College Democrats have done on campus this semester. Hanson said Temple College Democrats is celebrating and making plans for Obama’s inauguration. The organization will then shift its concentration to local and state politics. 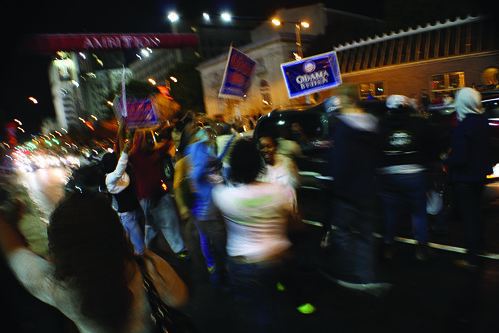 Excited voters flooded Broad Street on election night after President-elect Barack Obama’s win (Dan Dat Nguyen/TTN). “We’ll keep working to make sure the promises made to students and all Americans are kept by local and national politicians,” Hanson said. Nerozzi said the College Republicans will be taking it easy for a while. Members are currently planning a trip to the Conservative Political Action Convention where prominent Republican figures will speak. Speakers this year include Alaska Gov. Sarah Palin, former Arkansas Gov. Mike Huckabee and former Massachusetts Gov. Mitt Romney. “The morale of the Temple College Republicans is not at its highest, but generally everyone is supportive,” Nerozzi said. “It’s quite exciting having the first African-American president,” political science professor Gregg Lindskog said. Lindskog said he thinks Obama will work with President George W. Bush during the transition period or step back and build his cabinet and announce his policy initiatives. Nerozzi said he expects Obama to be tested in the first months of his presidency. Johnson said he thinks the election of the first African-American president will have some effect on society, but it’s not going to be overwhelming. 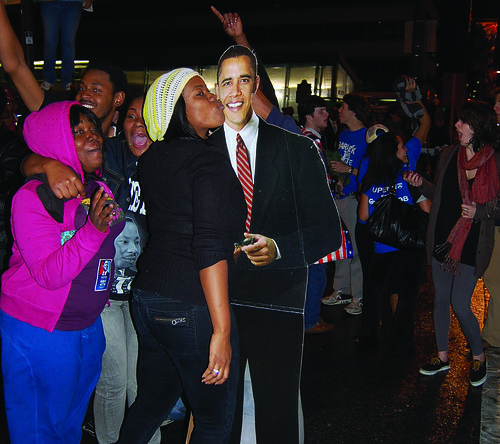 Democratic voters showed their affection for the President-elect (Colin Kerrigan/TTN). Johnson said the success of one person or one individual is not necessarily an indication the entire situation has improved. An individual case doesn’t change the stereotypes and situation of a group, he said. Johnson said the result will differ with each person. Those who have always been active will probably stay energized, but those who got involved due to social reinforcements will most likely revert back to their usual activities, he said.